Oh what a tangled web the markets are weaving for us today, dear reader! All the post-Trump trends in the market – strong dollar, strong oil, falling bonds – are under threat. But the biggest threat to stocks could come from an unexpected direction. I’m not talking about the US Federal Reserve, which meets today. I’m talking about treachery from robed senators. I’ll come back to betrayal and the death of a dictator in a moment. But let’s be practical and start with oil. And to begin with, no, the planned production cuts from Opec announced recently are not the “unkindest” cuts of all. But they are worth a look because they may lead to an investment opportunity. February Brent crude futures climbed over $55 per barrel in London yesterday. That was on the big news over the weekend that the world’s largest oil cartel (Opec) had convinced 11 non-cartel members to cut oil production by 558,000 barrels per day (bpd). This cut, along with a 1.2 million bpd cut by Opec, should be enough to put the oil market into a supply deficit (based on global demand of 95.5 million bpd). And voila, oil will be on its way up to $70/barrel in 2017! That’s the idea behind controlling supply anyway. You set the market price by agreeing production quotas (and not cheating on them). Opec has lost the ability to control prices in recent years, thanks to the shale producers in Texas and the rise of alternative and renewable energy. But check out the chart below. 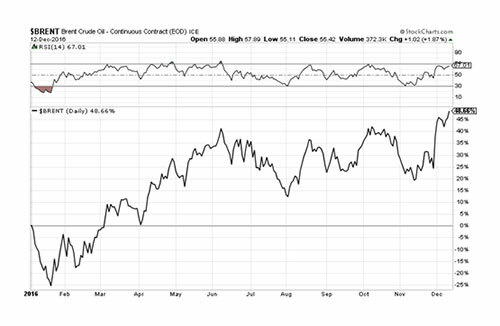 Brent crude bottomed in late January and has climbed steadily higher all year. Charlie Morris told me it would happen. Specifically, one of his first recommendations as investment director of The Fleet Street Letter was an energy fund that would rise with oil prices. That recommendation is now up nearly 50% since he first recommended it to readers in early February. In financial markets, supply and demand are always matched. It’s a remarkable mechanism – a social technology that finds equilibrium by price. We may not like the resulting volatility, but in the short to medium term, the system works. Over the longer term its brilliance is less obvious, because capital cycles are much slower than this price mechanism. That leads to a need for planning – something that is beyond the realms of free markets. If that doesn’t convince you, a recap of the oil market over recent years might. Oil rose from $20 per barrel in 2002 and that encouraged a new round of exploration, innovation and speculation. An army of entrepreneurs was happy to oblige. Then in 2006, oil passed $60 and George W Bush fuelled the boom in his State of the Union Address. He said that “America was addicted to oil”. Within only a few years, supply had become plentiful. New technologies combined with loose credit conditions returned US output to near record levels not seen since the early 1970s. It’s remarkable how quickly things turned around. US output last peaked in the early 1970s, which enabled Opec to tighten the market. Back then, Opec controlled the marginal barrel and it’s that last barrel that counts. It is either needed or it isn’t and it sets the price for every barrel. Today, we won’t see Opec cut production because there’s no point. It no longer controls that marginal barrel, so it may as well pump as much as it can in order to flush out the weakest producers. Just as rising prices boosted supply a decade ago, falling prices will cut it off. There are no volunteers to go first. Low oil prices are, in part, due to a slowing global economy and efficiencies, but more pertinently, they have been caused by oversupply. For this we thank not only President Bush, but also Ben Bernanke. It wasn’t just a dream for American energy independence. In order to become a reality, there was a need for cheap credit. A combination of policy, low interest rates and quantitative easing all played their part in the US resurgence of oil production. It’s always simplistic to say it costs $65 or $80 dollars per barrel to drill, because the variance around the world is enormous. There’s a huge difference between the costs in Saudi Arabia and the costs in the Canadian tar sands. Estimates vary widely because it’s a complex question that is often oversimplified. In US shale, it costs billions in capital expenditure (capex) to set up the drilling operations and once that’s done, the producers hope to be compensated for their efforts. At (say) $100 per barrel, shareholders continue to receive their dividends. As oil drops towards $60, the dividend is cut and capex is no longer being rewarded. On the way to $40, the repayment of the bonds comes into question and their prices fall sharply. Despite all of this, the pumps will continue to generate cash below $40. The market is yet to discover the shut down production price. Before drilling began, that vast capex had to be funded and the US producers achieved that by issuing bonds. The prices of those energy bonds have fallen, which means they are showing signs of distress. At these prices, investors are less confident they will get their money back which implies that oil is trading at unsustainably low levels. The Fleet Street Letter readers had a great preview of virtually everything that would happen in the oil market in 2016. The price was unsustainably low. It began rising, along with early signs of rising US inflation and noise about higher US interest rates. And up until very recently, Charlie was right that Opec would simply be unable to agree on production cuts, mostly out of self-interest from cartel members. Does the market now believe that Opec has regained control of the “marginal barrel”? That’s the big question. Will Opec members and non-cartel members have the guts to stick to production cuts when the incentive to cheat (rising oil prices) is staring them right in the face? Charlie is working on his last The Fleet Street Letter of the year as we speak. But he’s already charted the 2017 strategy for readers. If you’re not a reader and you want a brief overview of that strategy, then you need to read about his 2017 Money Map. If oil heads higher and the US dollar heads lower (it was down against the euro, the pound and the yen overnight) it will be the return of more traditional relationships in markets. Inflation expectations tend to generate higher commodity prices, lower bond prices and, obviously, a weaker dollar. But on that last bit, what could account for a weaker dollar? Let’s leave aside the Fed, which could disappoint merely by doing what it said and not anything more. How about Republicans in Congress sabotaging Donald Trump’s plan to make America great again? It would be a sneak attack from trusted allies. But any student of history or literature knows that it’s not your enemies you have to fear. It’s your friends. Shakespeare, via Marc Antony, tells us that it was ingratitude that killed Julius Caesar more than treachery. Cold steel to warm guts didn’t help. But when Great Caesar was betrayed by his beloved Brutus, the betrayal “burst his mighty heart”. The Republicans in the US Congress are threatening to block Trump tax cuts and spending increases. On what grounds? On the grounds that the US deficit is already too damn high. How high? $20 trillion high. Mitch McConnell (the majority leader in the Senate, here playing the role of Brutus) and Paul Ryan (the speaker of the house, and every bit a Cassius with his lean and hungry CrossFit look) are absolutely right. The US debt is too high. Borrowing more and spending more will not make America richer. And if to be rich is to be great, more debt certainly won’t make America great again. But no, that is not the whiff of treachery you smell in the air. It’s the stench of hypocrisy. The establishment Republicans in the Capitol never wanted Trump to begin with. They didn’t oppose him on principle – after all, they were the ones who ran up the big deficits they now claim to fear. They opposed him because he answers to a different master. Trump isn’t yet controlled by the same interests who pull the levers of power in Washington – the big Wall Street and defence industry players in the Deep State who are used to getting what they want from the US Congress. Which brings me back to a final point for the day: you can’t do anything about who’s in power, what public policy is, or what direction interest rates take. All of those decisions are beyond your control. The people you vote for don’t really answer to you. They answer to a whole establishment that’s behind the scenes – a kind of “political dark matter” that exists without being visible. The only thing you really control – and the only thing you can do on behalf of yourself and your family – is what you do with your money. I’ve come to believe, after nearly 20 years in financial publishing, that the best route to a free life is achieving financial independence, so that you’re not at the mercy of events that are beyond your control. That’s not to say you can’t live a good life without being wealthy. Wealth is about more than how much money you have. The work you do, the quality of your relationships with family and friends – these are some of the factors that contribute to what I call real wealth. But financial wealth does give you a bit of freedom, if by “freedom” you mean the ability to make your own choices and take the actions you want. Here’s to freedom, while we still have it!